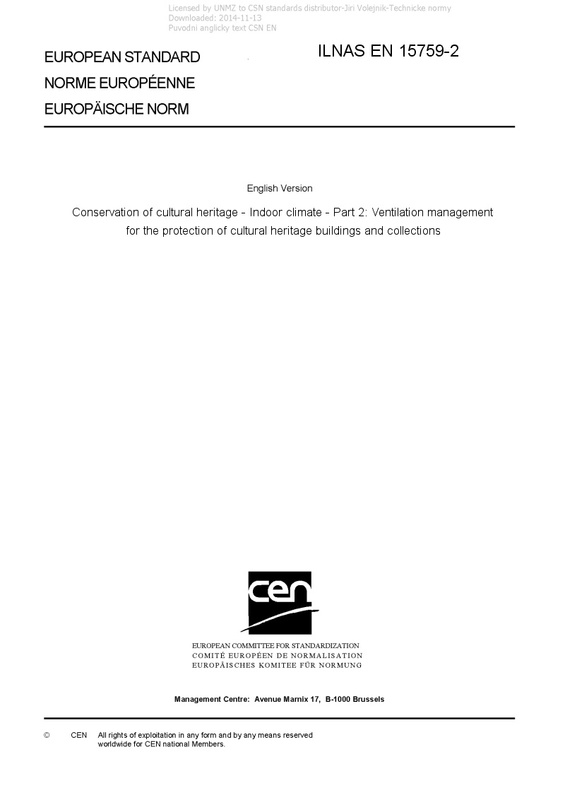 EN 15759-2 Conservation of cultural heritage - Indoor climate - Part 2: Ventilation management for the protection of cultural heritage buildings and collections - This European Standard gives guidelines for ventilation management in order to improve the preservation conditions of cultural heritage buildings and their collections. At the same time, it is aimed to create an indoor environment for a sustainable use of these buildings and their collections. This standard is a complement to existing general standards for ventilation that are focused on human comfort. This European Standard is the second part of a standard on indoor climate in cultural heritage buildings, i.e. EN 15759 1:2011. It should be used together with the first part when considering selection of heating strategies and heating systems for cultural heritage buildings, or buildings housing collections. It may be also used when considering other issues, e.g. assessment of buildings, interiors and contents, or improvements for the energy performance. This European Standard deals with indoor climate conditions, ventilation strategies and generic technical solutions for their implementation but not with the technical equipment itself.